We got a special delivery to our backyard a few weeks ago. 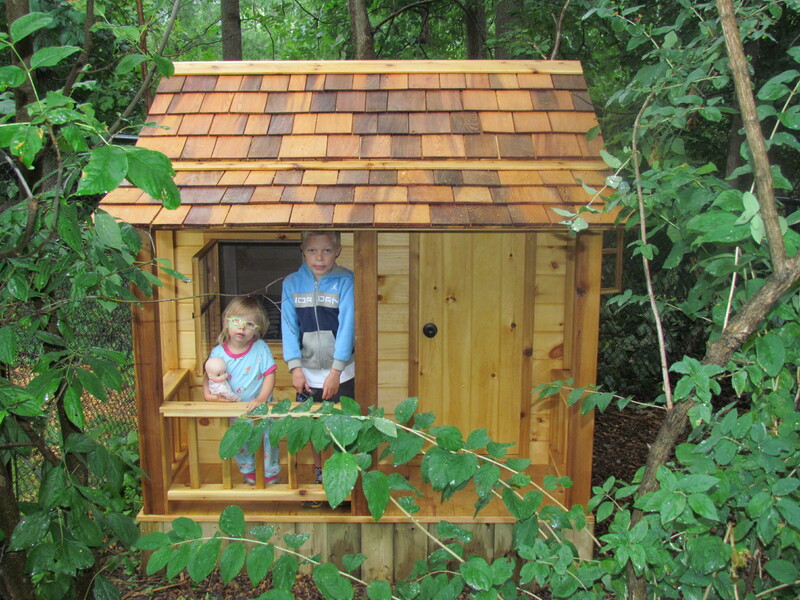 Tucked into the wooded trails at the bottom of our hill, now lies a quaint little 7’x7′ wooden playhouse, complete with a front porch, two screened-in windows, and set of bunk-beds. To say that my children love it would be an understatement. They are captivated by the sense of independence it brings, its magic of make-believe, its let’s-create-our-own-world environment. We’ve gathered up some blankets and pillows, found a table and chairs, and bought a broom and a fly-swatter. It’s become a little house where adults aren’t allowed and children’s imaginations can grow. It’s theirs. All theirs. The smell of sawdust and shadows of tree branches only add to its intrigue and memory-making potential. This playhouse is a bit of a family tradition for me. You see, my grandparents gifted a playhouse to my brother and I when we were very young. It was literally a miniature house, with cupboards and a sink, a rain-echoing roof, and a linoleum floor. And we loved it. Hours upon hours were spent inside, in all kinds of weather, while we let our imaginations run wild and our dreams set foot. We read books, we had sleepovers, we swept and mopped and washed and dusted. It was a little piece of the adult world shrunk down to fit a child. And my parents have now gifted a playhouse to my children; a gift of fantasy, of resourcefulness, of creativity. A gift of imagination. When I see my kids playing in there, I can still hear those creaky old bunk-bed springs, still feel the coziness, still smell the stale air, and still see the little girl who was given a place to dream big. This entry was posted in Parenthood and tagged childhood, imagination, kids, playhouse. Bookmark the permalink. So amazing!! Where did you find it? We hope that the kids have lots of good memories in the future, of many hours of playtime and fun in the playhouse. My sister and I used to make mud pies galore in our playhouse … it was such simple fun, simple pleasures. It looks like you have a little cabin in the woods! We love it already! Thanks again Mom! Love it! What a wonderful gift…. As your Mom said, Ash, it does look like a little cabin in the woods! Really brings back fond memories of our old playhouse, which was an old ‘outbuilding’ on the farm, unlike your very ‘cute’ playhouse that you had sitting in your yard when you were a ‘kid’ and the cute cabin sitting in your yard now. They all ‘work’ for hours of fun and imagination! You will have to come for a visit and see it in person!